other characteristics: The Mountain Gorilla is one of the most endangered animals, too. In early times it was reagarded as a monster due to its big body size; later Hollywood justed that. 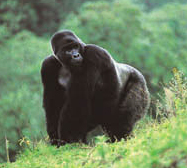 The Mountain Gorilla is the primate which is most similar to humans. It has the biggest brain among apes.